The bonus DVD is in the PAL format. 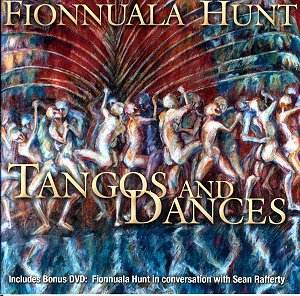 As Fionnuala Hunt explains in the brief bonus DVD that accompanies the disc this project has been, over the last three years, something of a labour of love for her. She�s arranged for orchestra some classic examples of the tango genre as well as exploring more contemporary trends � Varvello and Ziegler amongst them � and finishes with her own slyly Irish take on the form. Gade�s evergreen gets off to a bold and vigorous start with thwacking pizzicati and whilst the Danish composer may not seem a likely tango composer his Jealousy was an international hit. It�s Piazzolla however who stands at the crest of Nuevo Tango and it�s right that three of the works, the most by any single composer, should be his. I was more reconciled to Oblivion than is usually the case � there�s something about a melancholy leavened by sweetness in this orchestration that makes it less self-pitying than one generally encounters. Then again maybe Libertango is rather too static to communicate fully. The tango is La Cumparista � you�ll know it when you hear it, even if you think you won�t � though here it sounds to me, with the orchestral cushion behind Hunt, rather amazingly like a Brahms Hungarian Dance. She evokes nice violinistic colour from the Granados, albeit with a rather slow middle section and a touch of the generic in the orchestral strings and this applies to the Albéniz as well. There are examples of a "band within a band" approach when a small group of cello, bass, percussion and variants thereof, brings a certain acidic and resinously tough rhythmic approach that the equably orchestrated string patina can�t. You can hear this in the Varvello and the Ziegler, where there�s more sawdust and sweat in the air than padded concert seat. It�s good that Hunt lavishes affection on the Gardel and it�s always grand to hear Ginastera, in this case an orchestral arrangement of the piano piece Danza De La Moza Donosa which inevitably loses a degree of intimacy but wears a warm effusion well. She has usurped the cello�s solo in the Bragato but no matter, it was worth it, and Hunt�s own tango makes for a saucy pendant. The bonus DVD is an engaging one as both she and Rafferty are congenial company and articulate speakers. She�s certainly paid tribute to the song legacy of tango with care and affection.